If you’re reading this, I’m impressed that you’re here. 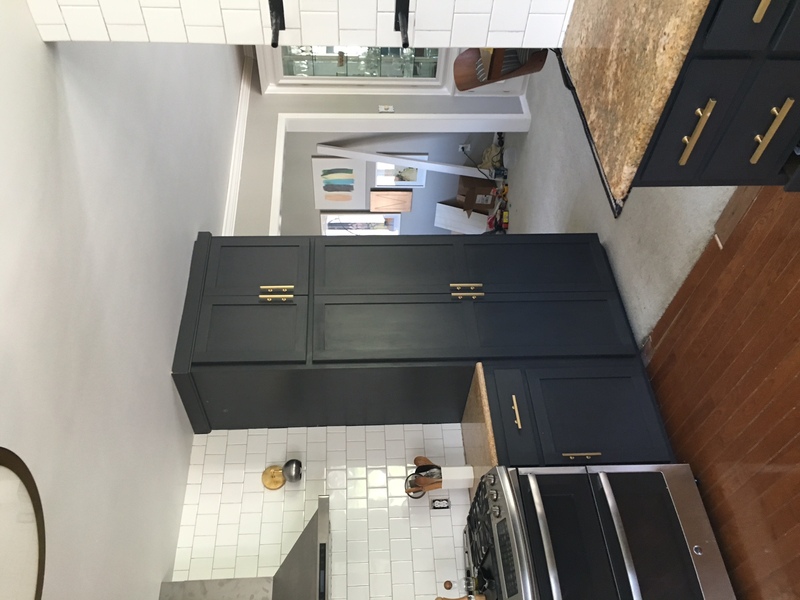 When I hit publish on all the details on the cost for our kitchen cabinets and drawers – I thought it’d be valuable to others, but was astounded by how much everyone loved seeing it. So, since that was so well received, I thought I would share about what went on with our asbestos drywall removal including the cost of it! It’s funny, because there are lots and lots of blog posts out there that explain how to do things for the homeowner. There are not many that tell you what to expect for pricing. 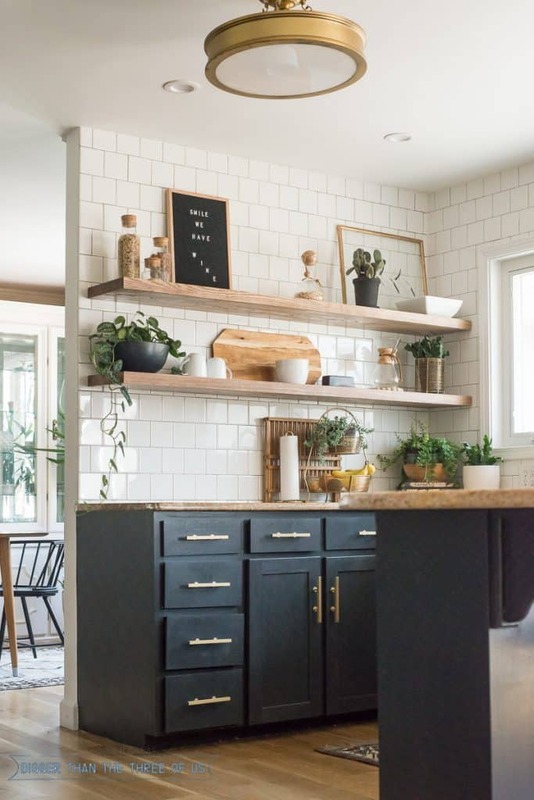 It’s pretty easy to get an idea on pricing for, say, replacing your kitchen sink and faucet. But, it’s much, much harder to get pricing for cutting into brick on an outside wall to enlarge a window. Believe me, I’ve googled it. So, as a homeowner, it’s so tough to know if we have gotten a fair or good deal. 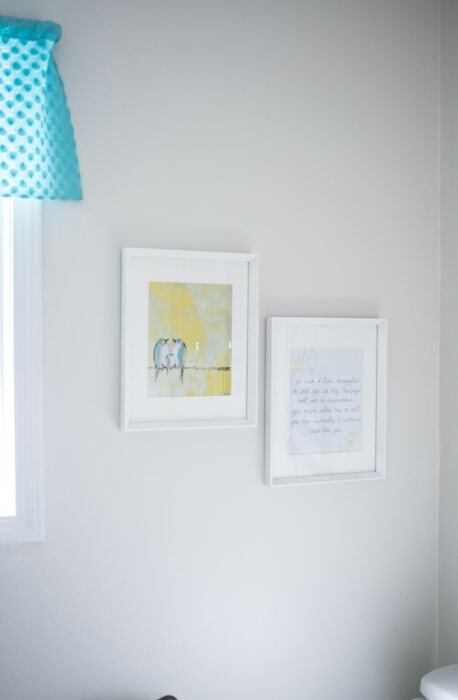 So, my hope in these types of posts, and this one in particular (Asbestos Removal and Drywall Install – All the Details Including Cost), is that it will help you know what you can expect in terms of pricing – or at least have a baseline for pricing. That said, I do understand that pricing will change depending on where you live. Still, I believe it’s great to have a ballpark number. Before I get into the nitty gritty details of the asbestos in sheetrock, I do want to mention that state law varies state-by-state when it comes to Asbestos testing, removal, and disposal. It’s some serious stuff, so you definitely want to do your homework on it; specifically, for the state you are in. Depending on what state you are in, you might have wiggle room for doing part of the abatement yourself. This is up to your discretion if you live in a state that allows it. Ok, let’s talk more about Asbestos. Asbestos is basically a group of fibrous minerals that is found, naturally, in the environment. It was thought to be an amazing find because you could use it for so many things. At one time, it’s was used for weaving in clothing, insulation, mixed with cement for building, in flooring, etc., etc., etc. It was a great find until it was directly linked to Mesothelioma. Now, since we are educated on what it causes, we don’t use it the way we used it before. But, lots of us still have it in our homes (popcorn ceilings, flooring, walls, insulation, etc.). You have a very high chance of having it if you live in a house that was built before 1975. When we bought our house, we had never heard of Asbestos, or if we had, we had no idea what it really was. 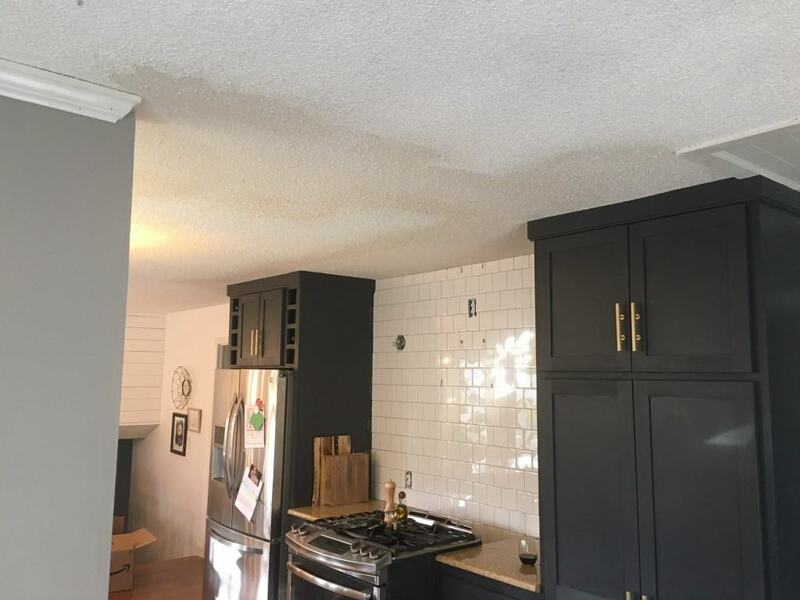 When we were walking around the house to decide if we wanted to purchase it, our realtor made an off-hand comment that we might want to test the popcorn ceiling before we start renovating. We bought the house and then decided to have the popcorn tested. We didn’t do any research on what a homeowner could/couldn’t do back in 2012. We had the tester come out, he basically wetted three spots in three different rooms and scraped the sample into different plastic bags. Then, he sent the samples off. We paid him $120 and a lab sent us the results. That’s just one sheet of a 5 page spread. But, you get the idea. 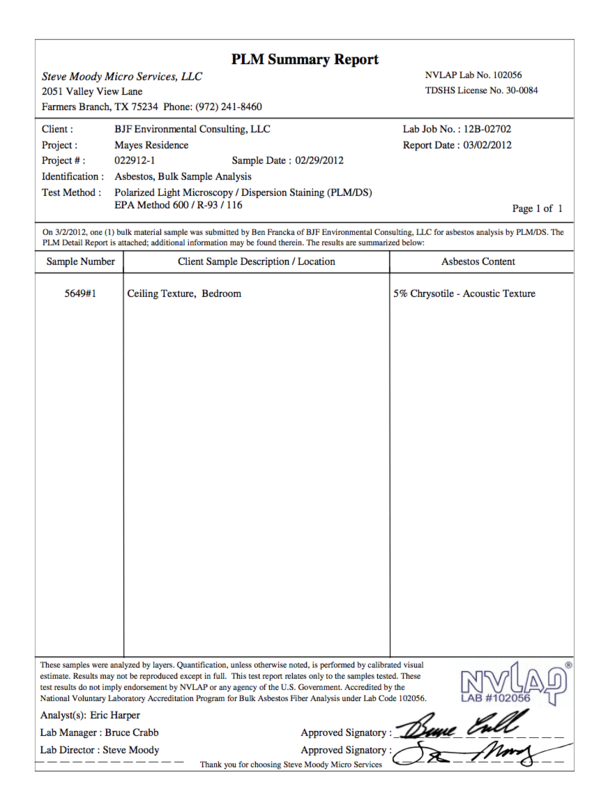 Under the column “Asbestos Content” you see “5% Chrysotile – Acoustic Texture.” That means there is 5% asbestos in the popcorn ceiling. I think it’s common to wonder if 2% chrysotile require abatement or in our case, does 5% chrysotile require abatement. Again, I really think that’s a personal question but I did find this article to be helpful if you want to reference it. When our house had the ceiling put up, workers just poured a bit of the asbestos into the mixture for the sprayer. At that time, it was totally normal to do that. It acted like a bonding agent and was basically thought to be a perfect ingredient. Back to the testing process. In hindsight, we could have saved a bit of money and got our own samples. *Remember to check your state law’s first! If you Google, Asbestos labs, there are quite a few of them that specifically tell you what to do and how to send your samples in. This will run you about $40 for the first sample and $25 for the next few. It is recommended that you test more than one spot. Back to the results, the results come back positive. Now what do you do? Well, you can leave it as is or have it abated (or abate it yourself – depending on your state law and how comfortable you are with this). We choose to leave it as is originally. Last year, we noticed the popcorn texture in our bathroom ceiling was peeling off (probably due to my excessively scalding hot showers; or at least this is what Luke says). This is definitely where you want to have the asbestos removed. The fibers in the ceiling can be disturbed and go airborne. You can’t see them, smell them or feel them. You’d never know they were there, but they are dangerous nonetheless. I think that’s the only picture I have of the space. Oops! That space isn’t our favorite and we haven’t done anything much in there to update it so it hasn’t had a spot on the blog. The space is about 9ft by 5ft. 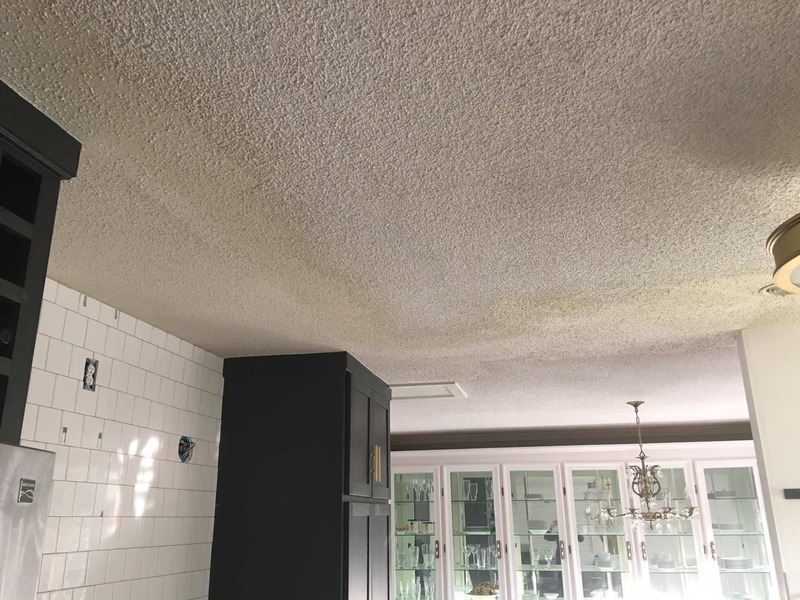 When we started renovating our kitchen, the goal was to spray more popcorn texture on the ceiling where we took down cabinets. We didn’t want to do this, but we didn’t want to shell out money to take down the ceiling either. I haven’t edited out the ceiling in our kitchen pictures, but I’ve made sure to not focus on it either. But, I did take a few iPhone pictures for you to see what I was talking about. The white part is the part with asbestos and the cream tinged popcorn is where we tried to match. Our kitchen is exceeding our expectations as far as how the renovation is looking and we just couldn’t leave the ceiling as it is. Part of the reason that the popcorn doesn’t match is that the original popcorn has been painted. So, let’s talk about our options. Well, in the state of MO, a homeowner can remove their own asbestos. There are rules around it, of course, and rules about disposing of it, but the homeowner can abate it themselves. After reading through multiple state’s guidelines and removal processes, we (or mainly me – Luke isn’t quite as conservative about this particular issue) decided that we would have it professionally abated. Removing it ourselves and potentially missing something, scares me half to death. There was an $1800 swing in prices between the three quotes. All three of the contractors came and said it would be hard to scrape the ceilings in the kitchen because it had been painted and was basically well-adhered. The bathroom had a possibility of being scraped and still having the drywall intact. What does this mean exactly? Well, this means that the drywall ceiling itself would have to be removed in the kitchen and dining room. This would incur an extra cost because we would have to have all new drywall. We decided on the quote/company we wanted to go with and then prepped for them. – Remove all insulation above spaces because there was a high possibility of having to remove all the drywall. We did this by hand and it was a pain in the rear! The quote to have this done was $750. – Remove all decor, furniture, curtains, etc. Basically, everything that was not built in to the rooms had to be removed. Just prepping for the whole process was insane. In hindsight, we probably should have just paid the $750 to have the insulation removed and put back in, but I’m cheap. We were already spending so much that I just couldn’t stomach another thing. 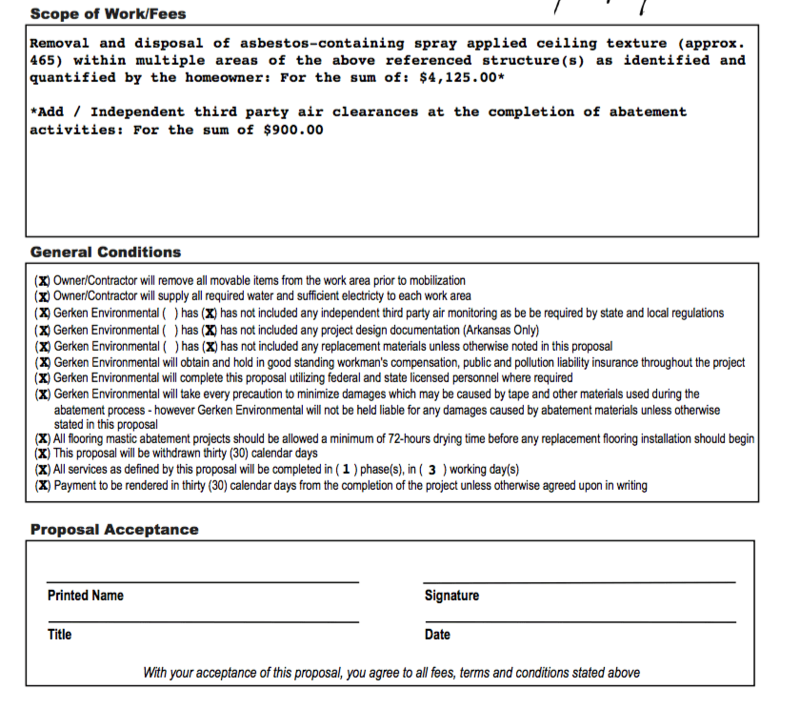 The abatement company came in and enclosed the whole space (seriously everything!) with heavy duty plastic. They used two layers and it took most of the day for the two days just to prep the area. The next day, they came back and removed the drywall. It was an all-day event where they ran negative air machines and more. Because everything was in a capsule, I didn’t see much of what was going on. Everything was bagged up and taken off. Later in the week, the drywall company came to do the install/refinish work. Apparently drywall runs $.75-$1.50 a sq feet depending on if you want textured ceilings or completely smooth ceilings. Smooth ceilings are the hardest to do because you have to do them good enough so that you don’t see any imperfections. Of course, I wanted the smooth ceiling ($1.50 per sq ft). We had been quoted 3-4 days for the drywall company to do their work. But, it turned into 7 days. The mud didn’t dry the way it was supposed to, so we ended up needing extra coats on the seams and the whole ceiling. By this time, we had been out of a kitchen for 10 days. Dust was everywhere from the sandings and I was getting extremely annoyed by living out of a cooler (and eating out!). So great, right? I didn’t touch up the shadows in photoshop or anything, so you are seeing the shadows. In person though, it’s smooth and gorgeous. All in all, we are thrilled with our choices and thankful that we don’t have to worry about the drywall asbestos any longer! 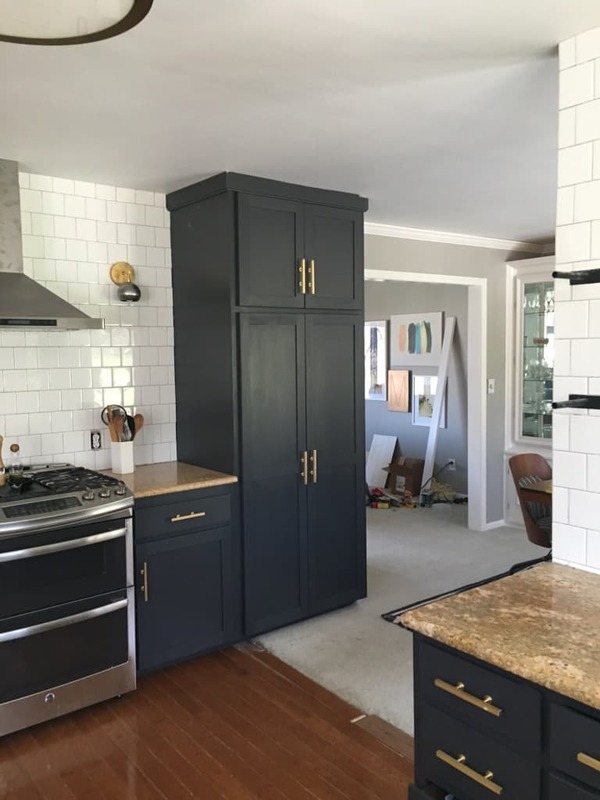 *Edited 06/20/17: I thought you might want to see the before/after of our kitchen. Getting rid of the popcorn ceiling the right way, drastically changed the space. 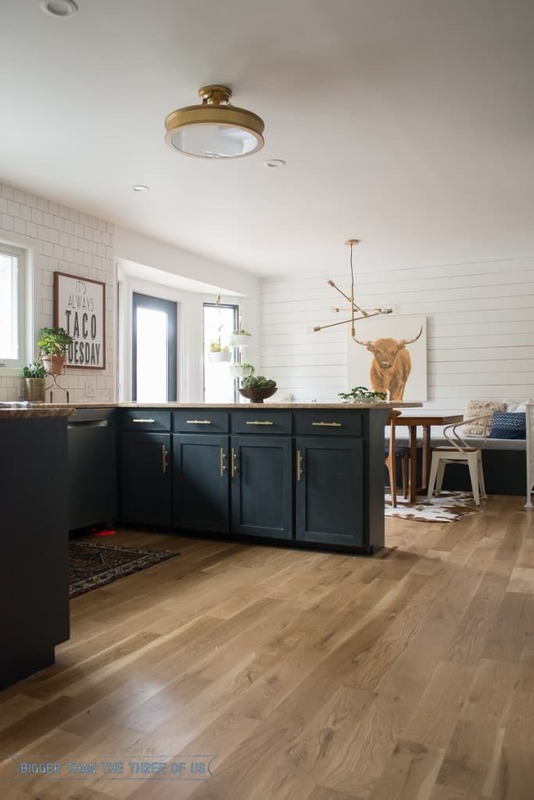 Check out the full kitchen reveal for all sources and details!